For all the newest 431 S Dearborn Chicago Loop condos available for sale and real estate listings in Chicago, view below! The Manhattan is a condo building located in Chicago, Illinois that offers a wide variety of amenities to fit any lifestyle. Search 431 S Dearborn condos for sale & real estate in 431 S Dearborn below. Browse our Chicago condos, lofts, Chicago penthouses and Chicago highrise condos for sale by location, size or price and let this website be your local real estate guide. We would love to be your Chicago real estate agents and assist in the condo buying process. To learn more about condos available in 431 S Dearborn or to schedule a private showing, contact your local Chicago Loop real estate experts today. Read more about 431 S Dearborn real estate. 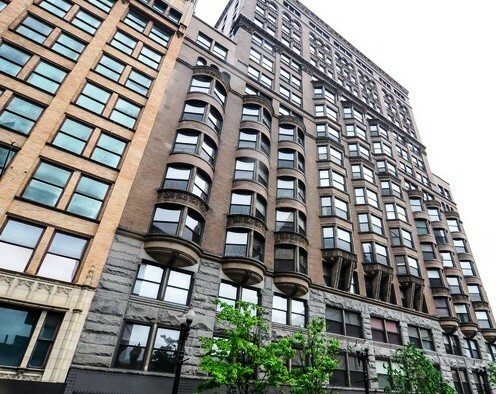 Interested in buying or selling a condo at 431 S Dearborn? Call Guarnero Group Compass at 312-810-6693, your local real estate team. Your neighborhood 431 S Dearborn real estate agents and agents are here to help you navigate the ins and outs of the Chicago Loop condominium market. One of Chicago's most classic condo buildings, the Manhattan Building at 431 S Dearborn is the third oldest high rise in Chicago. Situated just south of Chicago's busy central business district and corporate center at Dearborn and Congress, this property offers some of the most interesting condos for sale in the Loop. Many of the units have balconies, large bay windows, and in-unit washers and dryers, and all of them are pet-friendly, with extra storage and bike storage available. With a variety of units that range from six hundred to fifteen hundred square feet and a doorman and onsite maintenance and engineers, 431 S Dearborn condos in Chicago are a great option to check out if you are looking for Loop real estate for sale. There are also plenty of restaurants, bars, grocery stores, and convenience stores nearby, ensuring that it is not necessary for residents to own cars or drive in order to accomplish daily errands. Surrounded by plenty of dining, shopping, and entertainment options, the condos at 431 S Dearborn allow for an easy commute to anywhere in the Loop, the River North, or the West Loop, this building is within walking distance from Grant Park, Soldier Field, Museum Campus, Chicago's Theater District, and all of the excellent shopping on State Street and Michigan Avenue. Even Union Station is a quick cab ride away, and there is easy access to the expressway for commuters. Additionally, with a convenient location near the Harold Washington Library CTA stop and a variety of bus lines, 431 South Dearborn offers some of the best real estate for sale in Chicago's Loop. It is even situated near Roosevelt University, Depaul's Loop campus, and Columbia College, making it an ideal choice for MBA or law students. If you're buying or selling a condo at 431 S Dearborn, let our team of Chicago Loop real estate agents guide you through the buying or selling process today. As local Manhattan Building real estate agents and real estate agents, we have exclusive insider knowledge of Chicago IL market dynamics. Let us help you today! To learn more about agent representation while buying or selling your 431 S Dearborn condo, contact Guarnero Group Compass. Check out our comparative market analysis page to receive a free property evaluation in the Manhattan Building. We'll get to work for you today!